The front door opens into a hallway which leads to a bright modern open-plan kitchen/dining area with dishwasher, microwave, electric oven, ceramic hob, fridge, freezer, washing machine and tumble dryer. The large dining area has a pine table and 6 chairs, antique side table with DAB Digital Radio and Bluetooth Speaker. The French windows lead onto an enclosed paved patio area with flower beds and table and chairs. Downstairs there is also a WC and basin. Upstairs you will find a light and comfortable sitting room with views of the river, open fire, Freeview TV and DVD. In addition to the sofa and armchairs, at the far end there are two single divan beds with throws and cushions. This floor also provides a spacious bathroom with bath and shower over, basin and toilet. Stairs to the second floor lead to a large attractive double bedroom with dramatic wall hanging over the bed and a small children's bunk bedroom with roof window. Travel cot and high chair are available. 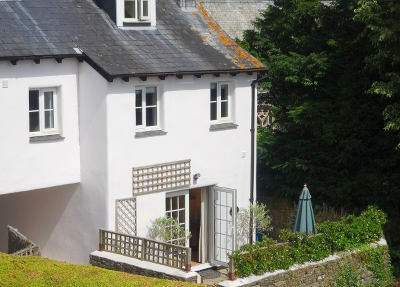 This quality cottage is cleverly arranged over three floors and is situated in the heart of the village opposite the church and next to the Red Lion Inn. 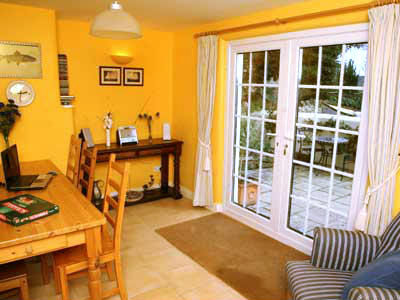 The cottage offers superb views up the river valley to the moor and south over the village. The river Dart is only a few minutes’ walk away.